Guwahati Frontier of Border Security Force observed World Arthritis Day at Patgaon in association with Composite Hospital, CAPF located here, on Friday. 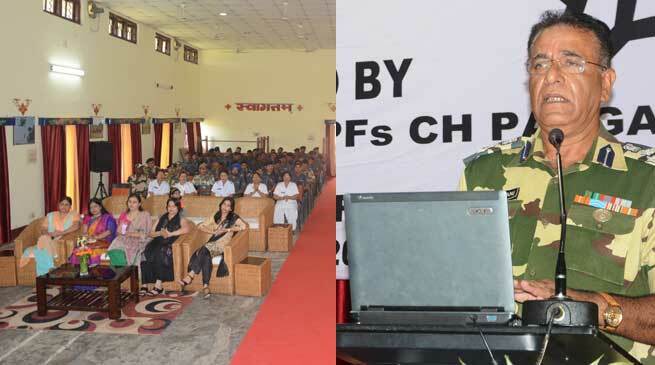 A health awareness program was organized by Composite Hospital, CAPF BSF in collaboration with medical staff of NDRF and BSF. The program was inaugurated by Sh S K Maghu, DIG in the presence of Dr B J Lalwani, DIG (Med) MS, CH CAPF Patgaon, Sh Kailash Chand, DIG & BWWA President Smt Minty Asha Lalwani. Welcoming the audience Dr Lalwani, explained the various reasons for occurrence of this painful disease and exhorted all force personnel and their family members to take measures that would be suggested by the speakers, during the program, to prevent it. He also suggested various preventive measures to have a life free from this disease. During the program, Dr T Azam Ghouse, Medical Officer of 1st NDRF Bn, Guwahati highlighted that our body joints have a firm but flexible connective tissue called cartilage which protects it by absorbing the pressure created during movement. A reduction in the cartilage tissue caused arthritis. He emphasized that prevention was the only way out to prevent this disease and further exhorted the participants to carry out physically activities like exercises and yoga to manage and prevent this disease. Similar awareness programs were also organized in the Battalions and Sector Headquarters of Guwahati Frontier at Dhubri, Falakata & Cooch Behar.